Picture perfect...can you smell the sea? Feel the soft breeze against your skin? Hear both the silence only the open water can bring and the busyness of life all around you? Intrestingly enough, when this picture was taken, Pearl Harbor was either about to be bombed or already had been. Two island ports, one a haven the other in hell. Sound of the Day: Frog songs. With all the rain we received yesterday, the pond next door has filled in making all the froggies very, very happy. They've been singing like crazy. :) Though I suspect part of their song is thanks for not being fried by the lightening! LOL The show was incredible and thankfully I got my computer turned off before anything could happen...that would be just my luck. Quote of the Day: There are worse crimes than burning books. One of them is not reading them. 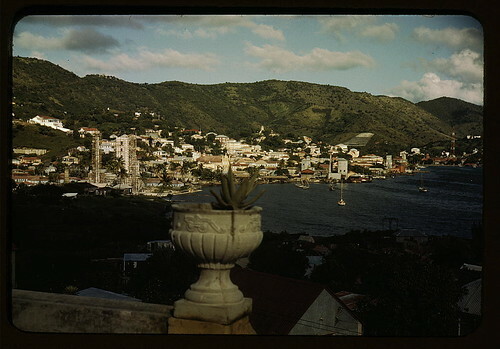 That 1941 pic of St. Thomas brings back good memories. I've been to the island a couple of times, and absolutely love being on the ocean sailing between the Virgin Islands. Oh, yes, an Arlo concert! That would be fantastic. All power to you getting good tickets. We had lightning last night and this morning, but not much rain. Yeah, I turned off the computer, so no writing got done. Luv hearing the froggies. Earlier this season their song was deafening in a good way. Thanks...I've seen Arlo only one other time and the tickets weren't so great. I'm hoping for better this time. Yeah, the froggie song was really nice this morning. I just stopped and listened, very relaxing! I don't know what the Virgin Islands are like nowadays. That was back in early 80s. That area felt like home to me. And if things were different I'd love to go back!! !